My estate has existed for 5 generations (beginning in 1839). 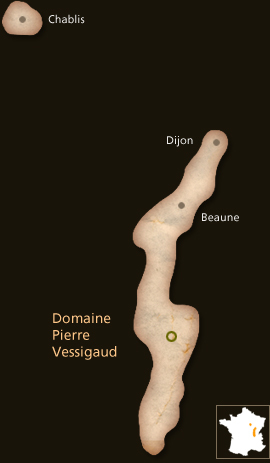 The domaine VESSIGAUD is located in the hamlet of Pouilly in the heart of the appellation Pouilly-Fuisse. I took over the estate after my father in 1988. Since 1998, without claiming the organic label, I ve been working the most natural way possible in my vines. In 2010, I decided to ask the organic conversion with the label Ecocert (AB). I am plowing all my vines, around 8 hectares : 3 hectares in Mâcon and 5 ha in Pouilly-Fuissé. My vines are 35 year old on average. Characterized with a south, and south east exposure and a soil made of chalk, clay and marne and stones. Located at 200-250 meters high. High density of plantation : 8,500 feet/ha. I am only using sulphure and copper to protect my vines. I am harvesting manually in cases, and press the grapes directly without distemming. Only use of wild yeast. Fermentation (alcoholic and malolactic in barrels). Barrels from 1 to 10 year old. Minimum ageing for 12 months for the Pouilly-Fuisse « Vieilles Vignes ». My cuvée « vieilles vignes » is a blend of 7 different plots : « Les Tâches, Les Ménétrières, Les Combettes, Vignes Blanches, Les Reysses, Les Châtaigniers, Les Champs ». They are all vinified and aged in different barrels separetely and then I blend them together six months before the bottling. So ageing for 6 months in stainless steel tanks before bottling. I want to produce wines with always more précision, given by time, patience and fine ageing in good barrels. I am looking for frehness, crispness and minerality in my wines. I want them very powerful and drinkable at the same time with a recognizable balance (good acidity) every year. I have very low yields of production, under 40 hl/ha in order to get a good density in my wines. I love biking in the vines and the amazing landscape of Southern Beaujolais, with its amazing hills surrunded by the two famous stones of Vergisson and Solutré. My estate is located very near the solutré rock. Winegrowing: plowing the soil, short pruning in Guyot simple with « pliage en Arcure », and green harvest. Only use of sulfur and copper for treatment. Manual harvest in cases, long and direct crushing, fermentation of 100% in oak barrels. The Estate is working as organic since 1998. Pierre started the conversion officially in 2010. “Vers Agnieres” has a well-defined and more exotic nose compared to its peers, with ripe mango, apricot and citrus aromas that have an alluring purity. The palate is well-balanced with rounded and ripe clementine, white peach and tinned- apricot notes, matched by a keen thread of acidity and fine precision on the finish. This manages to pack in so much flavor, but keeps everything on a tight leash thanks to its razor-sharp acidity. This is a wine with a lot of finesse, combining minerality and purity. Winegrowing: uses low doses of copper and sulfur, regular plowing vines. Winemaking: handpicking, pressing of whole grapes. Maturing on fine lees for 12 months in oak barrels. In conversion to organic farming since 2010. “Vers Pouilly” has a refined and complex bouquet with nuanced scents of passion fruit, citrus peel and limestone. The palate is well-balanced with a fleshy ripe opening of clementine, citrus lemon and lime, struck through with a silver thread of acidity leading to an elegant finish that does not shortchange on either flavor or length. This is a very impressive wine from Vessigaud, one of the finest that I have encountered from the estate. Winegrowing: only low doses of copper and sulfur used, regular plowing vines. Winemaking: handpicking, pressing of whole grapes (no crushing). Maturing on fine lees for 12 months in barrels. In conversion to organic farming since 2010. Nice red ruby robe with garnet tints. A charming nose very reminiscent from the Pinot with spices and cherry notes, aromas of red fruits, cassis. In the palate, the wine is very fruity, spicy with long and soft tannins. Very velvety and smooth. A seductive nectar! Flexible and powerful in the mouth which gives the choice to be drunk within a year or leave in the cellar for ageing. Winegrowing: uses only low doses of copper and sulfur. Regular plowing of vines. Winemaking: Grape harvest broken, semi-carbonic maceration for 15 to 18 days.